Apple announced the new improvements that were made to the previous version of iOS. In order to meet the user requirements and make iPhone more user-friendly Apple updated many features of iOS5. Along with the features such as Facebook integration, maps app and siri integration, safari also came with much more improvements than before. The features of improved safari of iOS6 are listed below. Safari in iOS6 got iCloud tabs. With this, users can view list of tabs that were opened in multiple compatible devices. All the links that are opened across all iOS devices are synced. User can access these links by tapping new iCloud button. You can also know which link is open on which device. Since you can access from any device, it is possible to continue your reading or browsing without interruption. With a smart phone at hand we are doing everything. Now offline reading also made possible with safari in iOS6. Mobile Safari does not save the web pages just as links. So you can read the web pages even without internet connection i.e., in offline mode. You can save this offline reading list by enabling or disabling the cellular network feature in your settings. You can read the web pages from anywhere now! What will you do if you want to upload a photo to your favorite website? You will go to your system and upload it. But, it is no longer necessary to go to your computer whenever you need to upload the photos or videos on web page. In iOS 6, you can upload photos directly from the camera roll in Safari itself. 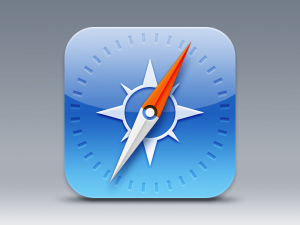 Safari in iOS6 made it easy to view and navigate the web pages. With iOS6 safari, you can switch to the full screen mode when you flip your mobile to landscape view. In landscape view you can find a button in the bottom at right corner of the toolbar, this button allows you to switch to the full screen mode. Apple has added some more options to the share menu in iOS6. Three more options, copy the URL, share the link on Facebook, share the link using Message app are added to the sharing menu. Fastness is the default feature that will be added to every updated version. So, iOS 6 will be much faster that previous version of iOS.